Ba-Boom, the Boisterous is the third boss in the game Donkey Kong Country: Tropical Freeze. They are a trio of baboon brothers serving as the boss of Bright Savannah, appearing in the level Triple Trouble. Before the battle, the Kongs notice a Banana Bunch in the air by a wooden pole. As they try to grab it, a baboon slyly snatches the bunch. He then splits into the three members of Ba-Boom, all of whom promptly mock the Kongs, angering them. Ba-Boom consists of a trio of baboons, though their bright cheeks make them more closely resemble mandrills (possibly a reference to the fact that mandrills were formerly classified as baboons). Aside from their cheeks, their faces resemble a long version of Donkey Kong's, and they also have messy hair. They wear a Viking helmet with the Snowmad symbol, as well as bracelets on their arms and legs. The three look exactly alike except for the color of their cheeks and bracelets, being blue, teal and red. The three monkeys move quickly, often relying on his speed to attack. The Ba-Boom brothers attack by swinging a rope, and swinging a hammer. They can all perform a rolling attack, though they end up getting dizzy and vulnerable at the end of it. They also throw Watermelon Fuse Bombs, which can be spiky or green; the green watermelons can be thrown back at them. A baboon can also call his siblings to his side if they are not defeated. When two of the brothers are defeated, the remaining baboon will summon weaker specters of them, and repeat the aforementioned patterns. Him and these ghosts also swing back and forth in a chain formation while tossing bombs. To defeat Ba-Boom, the Kongs will have to damage the brothers, either by jumping on them, or by throwing their Watermelon Fuse Bombs back at them. However, the Kongs can only jump on their rear ends, as their helmets will render jump attacks on the head useless. However, this can be mitigated by using Cranky Kong's Cane Bounce. They are more vulnerable when on the ground, and they can be rolled into. Each brother can only take up to three hits, and as they take damage, their fur color becomes lighter. When one Ba-Boom member is defeated, however, the remaining members will fully heal themselves before beginning the next phase. Oinochi chōdai! Babūn de Gozaru "Your Life, Please! We are Baboons" (or "I am Baboon") Oinochi chōdai! is said to be how samurai issue a challenge, followed by them introducing themselves in the formal manner also used in the level name. 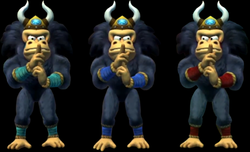 While the members of Ba-Boom are referred to as brothers in both the Japanese text and the Prima Games guide, the first baboon appears to use ninjutsu in order to create or summon two of them before the boss fight, as evident by his usage of hand seal movements. When a baboon performs a rolling attack, the animation and sound effect are similar to Sonic the Hedgehog's Spin Dash. Given how one of the baboons lured Donkey Kong into a trap with a Banana Bunch, this makes Ba-Boom the only other boss in the game (besides Lord Fredrik) to have seemingly known about Donkey Kong. ↑ von Esmarch, Nick, and Cory van Grier. Donkey Kong Country: Tropical Freeze Prima Official Game Guide. Pages 19, 130 and 131. This page was last edited on August 31, 2018, at 11:07.